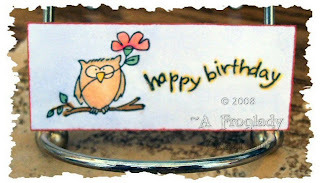 I used Studio G Hampton art stamps and my Palette Noir Ink to stamp the owl and the happy birthday sentiment. Copic markers B60, Y17, E37, E31, E11 and YG63 were used to color the owl, flower and around the sentiment. Of course it was a birthday so you need cupcakes right!!!!!! 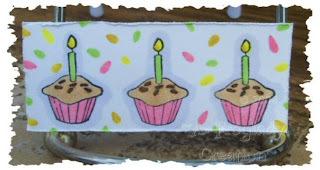 I again used Studio G Hampton Arts Stamps and Palette Noir ink to stamp the cupcakes in a row. Then I used Copic Markers YG03, RV13, RV04, B60, E31, E33, YR23 and Y06 to color them in and to make the "confetti" around them. What a fun mini project to work on making the "confetti" myself LOL! I used my Heidi Swapp edge distresser to rough up the edges of the cupcake one too. I love your moos! I guess I'm gonna have to get some copic markers (so expensive). They do a wonderful job though.